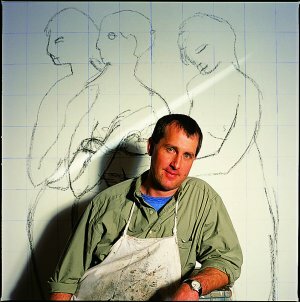 Brian T. Kershisnik is a well-known artist and a member of The Church of Jesus Christ of Latter-day Saints, casually called the Mormon Church. Because his father worked as a petroleum geologist, Kershisnik grew up living abroad in several disparate locations: Luanda, Angola; Bangkok, Thailand; Conroe, Texas; and Islamabad, Pakistan. He attended the University of Utah for a year and then served a mission for the LDS Church in Denmark. He then studied art at Brigham Young University and completed a special six-month program in London. After doing graduate studies in Austin, Texas, he and his family moved to Kanosh, Utah. He now lives in Provo, Utah, with his wife, Suzanne, and three children, but continues to paint in his beautiful Kanosh studio. This page was last edited on 6 December 2012, at 00:28.